A little-known but characteristic figure of the high Romantic era, the composer Heinrich Donatien Wilhelm Schulz-Beuthen was born on 19 June 1838 in the industrial town of Beuthen in Upper Silesia (now Bytom, in Poland). His original surname was Schulz: it was not unusual for people with such common surnames to add the name of their home town to distinguish themselves from others, as Schulz-Beuthen did at some point early in his career. He was intended for the profession of a chemist, and studied chemistry at the University of Breslau, but his drive to write music was greater. From 1862 to 1865 he studied with Moscheles and Reinecke at the Leipzig Conservatory, where Grieg and Svendsen were among his fellow students; he also studied privately with Karl Riedel. Finding Leipzig’s classicism uncongenial to his more romantic temperament, after his graduation Schulz-Beuthen left Germany for Switzerland, where he taught composition in Zurich from 1866 to 1880. In Switzerland he met Wagner, the novelist Gottfried Keller, and was befriended by Mathilde Wesendonck. He also became friends with the composer Theodor Kirchner, an important member of the Schumann-Brahms circle, and created an orchestral cycle out of arrangements of some of Kirchner’s piano pieces. Following a nervous breakdown (the details of which are not precisely known) Schulz-Beuthen returned to Germany; he was unable to compose for several years, but resumed his teaching activities Dresden, where he lived – except for a short period spent in Vienna, 1893-95 – from 1881until his death on 12 March 1915. His last years were spent in an asylum. Schulz-Beuthen was a copious composer: his works include five operas, of which the first, Der Zauberschlaf, after a play by Mathilde Wesendonck, combined the stories of Sleeping Beauty and Cinderella and may well be the first example of the ‘fairy tale opera’ which became a popular genre in the late 19th century at the hands, most notably, of Humperdinck. Unfortunately the music is lost, as are many other of Schulz-Beuthen’s works. He wrote no less than ten symphonies (of which the first and last remained incomplete; No.7 was inspired by Shakespeare’s King Lear), as well as symphonic poems founded on such subjects as Schiller’s Wilhelm Tell, Grillparzer’s Des Meeres und der Liebe Wellen, and Böcklin’s painting ‘The Isle of the Dead’. (Schulz-Beuthen’s treatment, one of his last works, is almost exactly contemporary with Rachmaninov’s well-known tone-poem on the same subject.) Other compositions included a Requiem, scenes from Goethe’s Faust, a piano concerto, a wind octet, string quintet and trio; choral works, numerous songs, piano pieces and so on. He had some distinguished admirers, including Franz Liszt, and contemporary critics sometimes found his music daringly modern: however these judgements were passed mainly on works that are no longer available for examination. The bulk of Schulz-Beuthen’s music was never published, and it is believed that most of his manuscripts were destroyed in the fire-bombing of Dresden in 1945. Nevertheless enough was printed during his lifetime, or has come to light in recent years, to indicate a composer of considerable gifts. Most of the piano works on this disc – they are all cycles of piano pieces of moderate dimensions, though of varying levels of virtuosity – seem to show Schulz-Beuthen trying out various modes of expression and different ways of combining individual pieces into a larger, if loose, overall design. All but one of them date from the single year 1873-74, when the composer was evidently strongly concerned with producing piano music. The Drei Clavierstücke im ernsten Style, op.16 (Three Piano Pieces in Serious Style), dedicated to Schulz-Beuthen’s mother, were composed in November 1873 and published the following year. There is more than a passing resemblance to Brahms’s near-contemporary op.76 Klavierstücke in these attractive pieces, whose ‘seriousness’ is stressed by some unusual expression-marks. While the outer sections of the opening E major Moderato are pleasantly lyrical, it is the grave central section – marked ‘Mit tiefster Trauer’ (with deepest sorrow) that holds the strongest Brahmsian echoes. The following Andante in A minor, described as ‘Einsam und trübe’ (Lonely and cheerless), is an eloquent if funereal mood-study. The third, an Allegretto moderato in A flat, carries the expression-mark ‘Mit schmerzlichen Ergebenheit’ (with painful submissiveness). Perhaps Schulz-Beuthen had in mind an image of a nervous, harassed housewife? – and yet this is a delightfully fluid and flexible piece, not over-cheerful but at least lively and effectively written in a way that Schumann might have approved. The five Stimmungsbilder, op.17 (Mood-Pictures) were also composed in 1873. These are shorter and simpler pieces – essentially a sequence of short waltzes in the manner of Schubert or Schumann. The first piece is a hesitant, rather dark-hued waltz in A minor, reminiscent maybe of Weber’s Invitation to the Dance. The following Grazioso in E major is much more fluid and perfumed, while the third in B flat has a distinctly military air. The dreamy fourth, in D minor, requires the left hand to spin the melody below and above the right hand’s peaceful murmuring, with a more passionate middle section. The final Risoluto, once again in A minor, looks at first to be developing into a capricious new waltz in rapid triplets, but this gives way to reminiscences of the first, second and fourth waltzes and the cycle ends tranquilly, now in A major. The Fünf Clavierstücke in Suitenform, op.19 (Five Piano Pieces in the Form of a Suite) were composed in June 1874 and published two years later. There are some indications that the ‘Suite’ of which Schulz-Beuthen was thinking was the Baroque keyboard suite, brought to its summit by J.S. Bach. The opening Allegretto in D is certainly a charming prelude in an archaizing ‘classical’ style. The succeeding Allegro giocoso in F is a kind of ‘hunting jig’ with deft touches of canon, and the Andante lugubre in D minor a melancholic contrapuntal sarabande. There follows an Allegretto in B flat which begins in neo-Baroque style but travels forward a generation or so in the middle section, markedappassionato. The sparkling Allegro fantastico in G with which the ‘suite’ concludes is a delightful bourrée where – as at several other points in this opus – the tones of the harpsichord would not be inappropriate. It was only three months later, in September 1874, that Schulz-Beuthen composed his Vier Clavierstücke im heroischen Styl, op.22 (Four Piano Pieces in Heroic Style). They were published in 1876 with a dedication to Julius Epstein, Professor of Piano at the Vienna Conservatoire – and a close friend of Brahms. This is one of Schulz-Beuthen’s most ambitious cycles, the layout of its four constituent movements approximating to that of a piano sonata. The opening of the C major first movement, marked ‘Edel und innig’ (noble and heartfelt) is deceptively gentle, but soon discloses a breadth of thought beyond almost all of the pieces so far heard. A contrasting tranquillo melody in D acts like a second subject, and both themes are subjected to impressive development in busy textures before a majestic, but ultimately peaceful close. The second piece (which carries the superscription ‘C.K.’, apparently a separate dedication, though the identity of the dedicatee with these initials is unknown) is a scherzo-like dance in E major, with a tendency to move quickly from the capricious to the grandiose. It has a lilting berceuse-like trio marked ‘In Seeligkeit schwelgend’ (literally ‘revelling in bliss’), and the trio melody returns at the end of the movement, to provide a gentle coda. The ensuing Poco moderato must rank as one of Schulz-Beuthen’s most beautiful inspirations, a serene nocturnal meditation in G major. The concluding piece returns heartily to the C major of the opening and is actually inscribed Allegro eroico (with the additional injunction con molto bravoura). It sets out as a vaunting, self-confident march, with hints of military fanfare, but is unexpectedly interrupted by an expressively lyrical A major episode. The transition from this A major back to the C major of the main idea becomes progressively more excited – Schulz-Beuthen marks it ‘quasi Cadenza’. The martial idea now returns in full, perhaps even pompous, splendour. Another production of 1874 was the set of Drei Clavierstucke, op.23 which Schulz-Beuthen, perhaps following further the tendencies disclosed in op.22, subtitled Cyklus in Sonatenform (Cycle in Sonata-form). The dedicatee on this occasion was Emil Behrens. This is however an altogether more modest set of pieces. The very attractive opening number in G major has the air of a rather gentle and reflective march, but with a jaunty fugato in C instead of a trio. The second movement is a tender and discreetly sentimental Allegretto moderato in E flat whose main theme is a subtle transformation of the opening theme of the preceding piece: one way in which the idea of the ‘cycle’ is created. The concludingAllegretto, a delicate mock-classical minuet, returns to G major (with a central episode in F, hinting at a bagpipe bass) to round off the collection with a whiff of old-time elegance. Finally the set of four short pieces that make up Abscheids-Klänge, op.28 (Farewell Tones) – which Schulz-Beuthen subtitled ‘Gedenk-Blätter’ (Pages of Memory) – is dedicated ‘To his friend Herr J. Schilling-Baumann’ and dated September 1880 in Zurich. Since the composer was about to depart that city after a residence of some 14 years, the ‘Farewell’ would seem to be his own. These pieces make up a kind of informal serenade, and are designated as playable by a string sextet of three violins, viola, cello and double bass, or by string orchestra, or (as heard here) by solo piano. They are quite simple and direct in their appeal, the opening Allegretto in C having a folksong-like main melody with a repeated figure that may be meant to represent an Alphorn. The following Poco moderato in A minor features a similar figure, but as accompaniment to an expressively melancholic theme that opens out into an episode of yearning chromaticism and a cadenza-like flourish before the end. The third piece is a sort of rustic gavotte in D major, while the concluding Andantino con espressione in F is clearly, from its elegiac tones and melodic warmth, the ‘farewell’ itself. 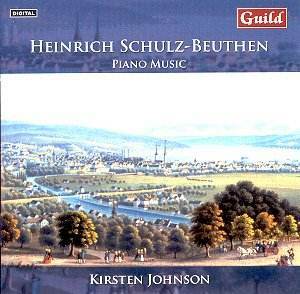 The compositions on this disc are all delightfully well crafted little gems, full of melodic inspiration and delicate textures, and the American born pianist Kirsten Johnson betrays a certain predilection for these works. Her versions are full of charm and grace, but also, when warranted, a certain virtuosic passion that brings out all the hidden nuances of these atmospheric pieces. The annotations by Malcolm Macdonald are first class, an adjective that can be attributed as well, to both the artistic and technical merits of this CD. Recommended especially for piano aficionados with a taste for the uncommon. The piano music on the all Schulz-Beuthen disc was written between 1873 and 1880, predominantly 1873-4.The Three Pieces Op. 16 are mostly Brahmsian in type although No. 1 is much closer to the dreamily musing Schumann. The Op. 17 Stimmungsbilder are free-ranging mood-pictures in which a Chopin-like elegance brushes the romance of Schumann. From a year later come the Five Piano Pieces Op. 19. The playful Baroque pointing of the Allegro giocoso from this set is very nicely done (tr. 10) as is the glittering and supercharged music-box jollity of the Allegro fantastico (tr. 13). The Op. 22 set starts most unheroically despite the title which seems to have been picked up rather casually from the last piece: allegro eroico. There is an ineffable Brahmsian contentment about the lovely poco moderato (tr. 16) and this is superbly put across by Kirsten Johnson. …Pleasing music-making here. Op. 16 No. 1 as well as Op. 22 No. 3 make this something that admirers of the romantic piano school must hear.